“Hey! If it isn’t the Dior model!” my producteur yells my way as I look over my shoulder for someone with supermodel powers and less sleepies under her eyes. I’m talking about my local veggie vendor, Sebastian. Biweekly, he is armed in his monochromatic fortress of seasonal treasures at my neighborhood market. “SHE’S AMERICAINE!” he exclaims repeatedly as his blasé little old lady clients turn their heads away. The biweekly mortification surpassed once the presents began. If customer fidelity is the result of free swag, I’m guilty as charged. I don’t know how he breaks even: the basil bouquets, cutting off a few euros here and there, and sneaking me a box of dreamy strawberries. Not only are his springs onions pulled from Mother Earth the morning of, he is my go-to guy for seasonal recipe suggestions. White asparagus stems can be sauteed, but the tough stems can be boiled then whizzed into a fantastically simple creme soup. And finally someone has debunked the myth behind chervil! Although I have compared it to parsley’s kid sister, it can be sprinkled on anything. And like everything else, it can be whizzed into an easy creme soup, too. A few days shy of reaching my 5-year mark in France, I rest forever loyal to good customer service. Additionally, I have started thinking more locally since I started following my friend Emily’s blog Paris Paysanne. Farmers are fewer these days. The global, local and ecological implications make up for the extra centimes of buying direct from the farmer. But instead of putting into my own words, trust Emily’s. And Sebastian’s. P.S. 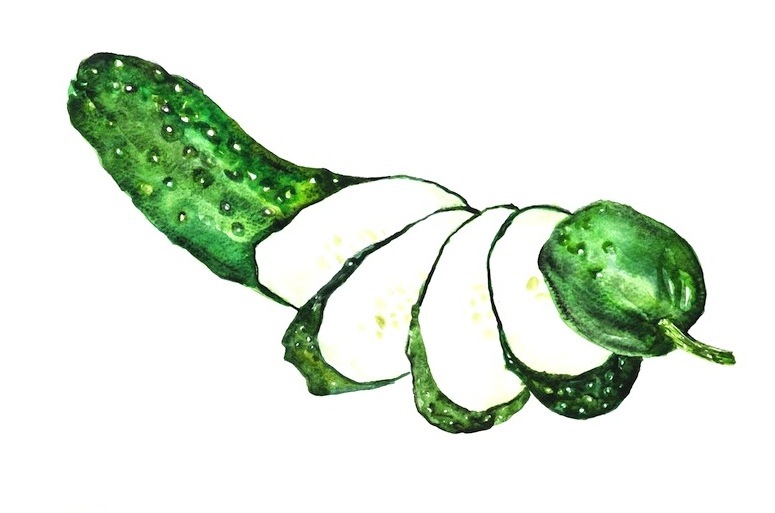 Your beautiful cucumber looks crisp enough to thinly slice over a wonderful garden salad. What a treasure you have in your local veggie vendor…..sounds like you brighten his day,too! I would love to be one of the “little old lady clients” and watch this scene unfold. Mille mercis and bon week-end. How about sharing those easily whizzed soup recipes?